Last Chance for 2012 – FOMP needs you! Tuesday September 11 at 6:00 PM – Trail work. FOMP is pleased to be holding a our final volunteer trail work and tree trimming work session of the 2012 season! FOMP and USFS provide all necessary tools. Volunteers should wear appropriate clothing for performing outdoor landscaping type of work. Volunteers should bring leather gloves, a personal water supply, eye protection, sunscreen, and bug repellent. We meet rain or shine unless there is lightning active in the area. In the event that you are joining us late we always leave a note at the trail head parking lot or you can call Jon Nordby (719.640.1347) or Chris Tirpak (719.439.8865) to find out where in the Preserve we are working that evening. This entry was posted in FOMP, Trails, USFS on September 10, 2012 by chris. Mt. Herman Rd is Now Open! Good news! Mt. Herman Rd is Now Open! Mt. Herman Road and some of the surrounding areas are now re-opened! Please see the zoomed in map below fo rthe Northern area of the closure and then visit www.fomp.org for the full map. We will also post an updated list of know open/closed as soon as we have a chance.Please note that fines for crossing into the closed area begin at $125 and go up from there.Enjoy! This entry was posted in Fire, FOMP, Limbaugh Canyon, Trails, USFS on July 19, 2012 by chris. It has been a chaotic couple of weeks in the area and we have up to date information on what is open, what is closed, maps, orders, and volunteer opportunities!1. Open or Closed? At the top of everyone’s mind … what is open and what is closed? The good news, the Preserve is OPEN! Despite some signage to the contrary it is open. We’ve worked witht the USFS to correct the signage and post maps. You do need to steer clear of Mt. Herman Rd – the machinery working on the road can throw rocks and debris 200+ feet – so stay away from the road. USFS 715 “Stoopid Trail” is closed where it turns SW in the SQ corner of the preserve. We have placed a sign there – that leads you into the closure – stay out or risk a ticket. The bad news, Mt. Herman Rd and everthing West of Red Rocks Rd to Palmer Lake and then West on 322 to Rampart Range Rd is CLOSED. There was a new order in place as of Friday closing this section. 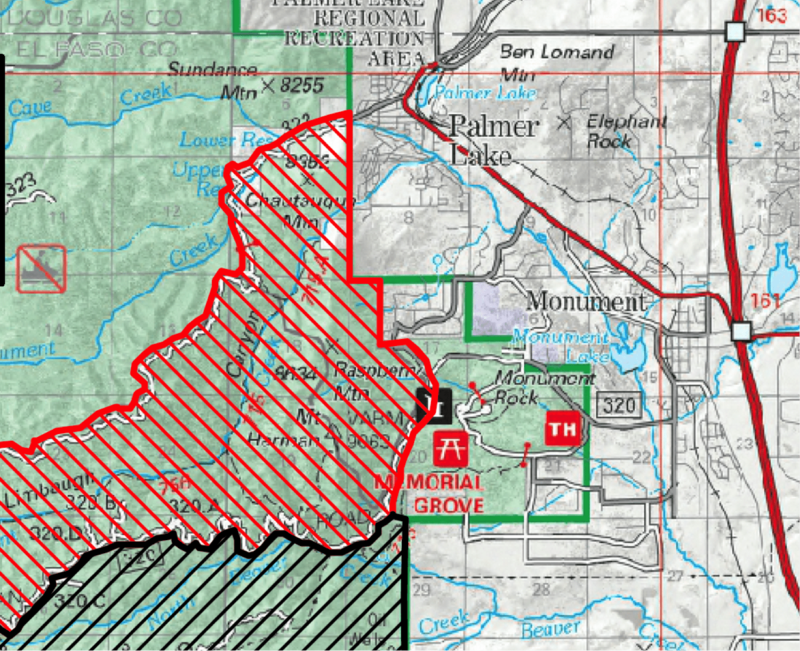 Why: So that the Forest Service can finish cleaning up the fire line on Mt. Herman Road – they are using masticulating machines and feller bunchers and they are also removing all the logs from the Mt. Herman Rd fire line. This will continue for several more days at the very least, maybe a couple of weeks. We hope that it will re-open after that but we have no firm date or commitment from the USFS yet. If we get one we will let you know. Please have a look at this zoomed in map of our area from the latest USFS closure order. A list of other regional openings and closings is at the end of this email/post. We still have high fire danger so be aware. The recent rains have not changed the fire danger. After FOMP volunteers cleaned up over 60 (yes 60!) bags of trash and debris from illegal shooting on Mt. Herman Rd the FS then cleaned up just as much 2 days later and closed parking and roped off these areas. There was approximately 2 acres total sutdown to shooting in areas that are not safe to shoot in the first place. Social ranges that were on the top of ridgelines with not backstop were closed down. Much, muc more remains to be done to make Mt. Herman Rd a safe place for other recreational users as some of the remaining social ranges have been utterly destroyed and shooters are shooting uphill with stray and ricochet bullets landing in Limbaugh Canyon still as well as on the Mt. Herman hiking trail. We continue to work with the USFS to try and make the Mt. Herman corrider a safe place again. The illegal shooting is just that – illegal and unsafe. It is in areas where shooting is allowed unfortunately many (and it appears a majority) of the recreational shooters on Mt. Herman Rd choose not to follow the rules of the USFS and are destroying trees and other resources as well as creating very dangerous situations for themselves and others. FOMP’s BOD continues to work with the USFS for good solutions for all parties including recreational shooters. FOMP is pleased to be holding a volunteer trail work and tree trimming work session! Falcon Trail (Air Force Academy) with military ID update: The Falcon Trail (Air Force Academy) is only under FPCON ALPHA, so only drivers license is required — update #2: Falcon Trail may be only partially open unless you have a military ID – please verify before you go! This entry was posted in Fire, FOMP, Trails, USFS on July 8, 2012 by chris. Shooting Range Cleanup and Reclamation work session! Update: Cafevelo Bikes is so excited to hear about the progress FOMP has made getting the shooting areas on Mt. Herman cleaned up that they would like to buy a coffee for any volunteer who shows up and helps tomorrow! FOMP will be collecting names and giving it to the owner on Wed. If you can not make it please be sure to show your support and drop by Cafevelo Bikes and show them some love in return for encouraging everyone to get out and participate and ride! FOMP urgently needs you for this special work session! Tuesday June 12 at 5:00PM or 6:00 PM – Trail work to clean up and reclaim shooting ranges in conjunction with USFS. FOMP is pleased to be holding a volunteer work session with USFS! informal shooting ranges that have resulted in massive resource destruction, trash, and very dangerous conditions on Mt. Herman Road will be cleaned up and closed down. Please bring heavy duty black trash baghs if you have them, work gloves, bug spray and a personal water supply. Primary work location will be up Mt. Herman Rd. about 4.5 miles, at the upper Limbaugh entrance. About 1 mile past where 715 crosses Mt Herman Road. Look for the vehicles, hard to miss. This entry was posted in FOMP, Limbaugh Canyon, Trails, USFS on June 11, 2012 by chris. FOMP would like to remind you that we will be hosting a Trail Work session Tuesday night May 10! Tuesday May 10 at 6:00 PM – Trail work! FOMP is pleased to be holding our first volunteer trail work and tree trimming work session for the 2011 season! It has been a long dry winter and we have lots of work ahead of us this summer so please join us! This entry was posted in FOMP, Trails, USFS on May 6, 2011 by chris. Please be aware that the Pike NF now has fire and smoking restrctions in place. This entry was posted in Fire, FOMP, USFS on April 22, 2011 by chris. FOMP would like to remind you of several upcoming events and volunteer opportunities. April 28 – Thursday 5:30PM – every year FOMP hosts a pot luck dinner for the Hot Shot and Helitac crew based in the Preserve. We will have dinner ready for the crews at 5:30pm. Drop in and meet the great team that will be based right here in the Preserve this summer as they wind down their training and get ready to go out on the firelines. FOMP runs this as a potluck style operation so please bring some food this is a hungry bunch and we could always use more! * Casseroles, crock pot dishes,etc.. for the main course. * Salads, breads,fruit and desserts to accompany the meal. The FOMP coordinator for the event is Diane Bandle and she can be reached at dmbandle AT hotmail.com. Please let Diane know what you might be able to provide or bring to the work center that day between five and five thirty. If you can not attend but would like to cook some food please let Diane know and she can accomodaye a drop off at her house prior to the event. This entry was posted in FOMP, USFS on April 5, 2011 by chris.